Dave Ramsey once said, "Debt is dumb, cash is king." Truer words have never been spoken. According to data from the U.S. Federal Reserve, the average amount of credit card debt per U.S. household is over $16,000. And even though debt and consumerism are the American way, staying up at night worrying about money doesn’t have to be the norm. The ability to make the minimum payments on all your debts each month doesn’t constitute financial stability. Your credit card bills may not be keeping you up at night yet, but if you analyze your financial situation, you may find that you are closer to the edge than you think. A long-standing rule of thumb says that monthly debt payments (excluding your mortgage) should not exceed 20 percent of your monthly net income. And while rules of thumb are a great gauge, don’t count on this one to be the final word concerning your relationship with debt. The 20 percent rule is an overarching starting point for evaluating your debt, but it doesn’t consider your total financial picture or your level of income. For example, if your net income is $5,000 a month and you pay little or no rent, $1,000 in monthly consumer debt is manageable. However, if you only earn $2,000 monthly, pay $800 in rent, and have to shell out $400 for credit card debt — you are in trouble. A better approach is to keep your debt-to-income ratio as low as possible. To stay out of the danger zone, financial experts believe that being at or under 15 percent is considered “safe,” between 15 and 20 percent is “at risk,” and above 20 percent is when sirens are blaring. The dangerous trend of charging day-to-day expenses is becoming increasingly common. A study conducted by NerdWallet found that household income has grown by 20 percent in the past 10 years, while the largest and most common expenses for most people — medical care, food, and housing — have outpaced income growth. 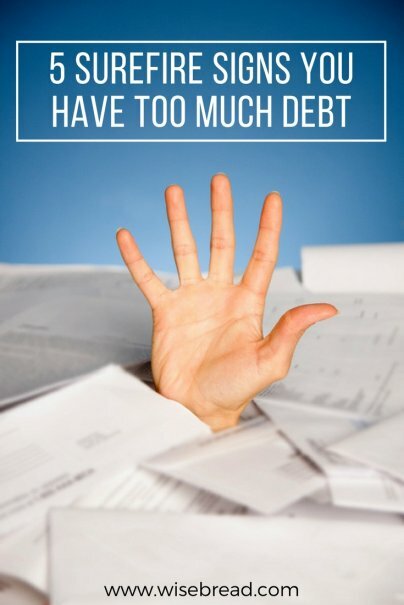 This is the primary reason why debt reduction is a must. It costs more to simply survive today than it has in times past. Repeatedly dipping into long-term savings to make ends meet or pay for unexpected expenses (car maintenance, traffic tickets, doctor's visits, etc.) indicates that you may have an issue with liquidity and savings. You also probably don’t have enough money to truly handle a financial emergency. Another good rule of thumb as it relates to savings is that you should have at least three to six months' worth of living expenses in an emergency fund. What constitutes an emergency are things such as a job loss or an unexpected medical expense. Your car note should not be paid from your emergency fund. The goal with credit cards should be to pay them off every month. When you only make the minimum monthly payments, most of the money is eaten up by interest and very little goes to paying the principal. Carrying a balance from month to month is costing you. For example, let's say you owe $5,000 on a card at 17 percent interest with a minimum monthly payment of $100. If you can’t afford to pay more than the minimum, you could be paying that bill for 27 years. And the icing on the cake? Over the lifetime of the debt, you would have paid double the original amount because of interest charges. If you are constantly missing payments, paying things late, or using one credit card to pay another, you are on a high-speed train to financial disaster. Things will only get worse from here if you don’t make some adjustments — quick. When you use your credit card to pay on other forms of consumer debt — especially other credit cards — you spend more money due to fees you incur. Most credit card, mortgage, and education lenders don’t allow you to pay them directly using a credit card. You have to go through a third-party service or get a cash advance in order to pay with your card, and both of those options come with hefty fees. The deeper you get into debt, the faster it mounts. If you find yourself in a situation where you are drowning in credit card balances, you need to take action. Step back, evaluate your situation, and make a plan. The first step is developing a realistic budget and eliminating unnecessary spending. You’ve got to be brutal and savagely cut the things you don’t need.